On this feast day of my favorite saint (sorry Ignatius!) a reflection from My Life with the Saints, on Thérèse Martin. On January 2, 1873, Marie Francoise Thérèse Martin is born in Alençon, France, to Louis and Zélie Martin, two devout Catholic parents. Louis, a watchmaker, had earlier in his life presented himself to a monastery but was refused permission, because of his lack of knowledge of Latin. Zélie was similarly rejected by a local order of nuns called the Sisters of the Hôtel Dieu; she becomes, instead, a lacemaker. But the couple's intense love for Catholicism and for religious life will be passed on to their children. Perhaps because of this supportive environment Thérèse is a sunny child and a naturally religious one as well. "I loved God very much," she would later write about this period, "and offered my heart to him very often." She is attracted to almost any expression of religiosity: the First Communion of her sister Céline she describes as "one of the most beautiful days in my life." As early as the age of two, Thérèse discovers within herself the desire to be a nun. Her two sisters' entrance to the Carmelite monastery in Lisieux only intensifies her desire to enter a religious order. Faced with the sad prospect of having to wait until the age of 16 to enter the monastery, an adolescent Thérèse travels to Rome with her father to petition the pope for a special dispensation to enter earlier. Her request is granted a few months later by the local bishop, and Thérèse enters the "Carmel" on April 9, 1888, at age 15. Her life within the monastery walls is short and uneventful: "lacking in outward drama," as Robert Ellsberg says in his book All Saints. Within a year of entrance she receives her habit. The next year she officially enters the novitiate and is assigned to care for the refectory and sweep the corridors. In 1890 she makes her profession of the vows of poverty, chastity and obedience. In 1891 she is named aid to the sacristan. In 1893 she paints a fresco in the oratory, and is named "second portress," that is, assistant doorkeeper. In 1894, on the morning of Good Friday, Thérèse awakes to find her mouth full of blood. Though she had been praying ardently that she might be accepted for missionary service in far-off Vietnam, Thérèse rejoices that she will soon be in heaven. Yet the onset of tuberculosis will prove not a quick and painless journey to heaven, but rather three years of intense suffering. During this same year, her father will die, and she will also be asked by her superior to write what would become her spiritual testimony. She titles it Springtime Story of a Little White Flower Written by Herself and Dedicated to Mother Mary Agnes of Jesus. It is this book that will ultimately draw millions of believers to Jesus, throughThérèse. The life lacking in outward drama is revealed to be full of inward drama. Surprisingly, she describes a powerful call to the priesthood: "I would like to perform the most heroic deeds. I feel I have the courage of a Crusader. I should like to die on the battlefield in defense of the church. If only I were a priest!" Thérèse devotes herself to prayer (especially for priests) and to the service of God in the monastery. She suffers small indignities at the hands of her sisters, striving to be as generous as possible even during her illness, always offering all of her "little" efforts to the God with whom she fell in love as a girl. Her book reveals both the pain and joy that accompany a life of faith. As Thérèse continues writing, her physical condition deteriorates. The last few chapters are written during a period of extreme suffering. On September 30, 1897, at the age of 24, she dies. Her last words are "Oh, I love Him...My God...I love you." But even at her death, the ever-dedicated disciple considers her work unfinished. There is so much more to do, by way of intercession for those she leaves behind: "After my death I will let fall a shower of roses. I will spend my heaven in doing good on earth." Two years after her death, her spiritual autobiography is published as Story of a Soul in a sanitized version by her sisters. The work is first passed privately among Carmelite convents but it eventually reaches the outside world, where its success surprises almost everyone. As a result of her "Springtime Story," Thérèse will become one of the most popular saints in the church—her story captivating, her example inspiring, and her "Little Way" accessible to millions of believers. In 1925, only twenty-eight years after her death, she is declared a saint. And in 1997 Pope John Paul II declares her to be a "Doctor of the Church," that is, an eminent teacher of the faith. She is one of only three women to have been so named (along with Saints Catherine of Siena and Teresa of Ávila). It is, most likely, her deep humility that has rendered her so potent and accessible a model for Christians worldwide. After all, who hasn't found oneself humbled by life's burdens? Who hasn't experienced one's own limitations? Who hasn't suffered? Thérèse is a saint that one feels would naturally understand one's own problems. Thérèse is someone that one can speak with. People feel comfortable with the "Little Flower." That term, by the way, gleaned from the original title of her autobiography, would eventually become a sort of saintly nickname. In the garden of God, Thérèse of Lisieux protested that she was only a "little flower," a small daisy compared to the more magnificent roses that she saw around her. (She called herself la petite Thérèse, in order to distinguish herself from her great Carmelite predecessor, Teresa of Avila.) Her famous "little way" is a spirituality that consists of doing small things with love for God, and a way of discipleship that stresses a cheerful humility before the Creator. But to think of Thérèse of Lisieux as simply a delicate little hothouse flower is to forget the considerable resolve that lay beneath the fragile petals. This was, after all, a person who at age 15 refused to let something as minor as church law stand in the way of her entrance into the monastery: she simply took her case to the pope. And in the face of a terminal illness, when her sense of spiritual equilibrium deserts her and she is faced with inner darkness and desolation, she continues to believe and to pray. 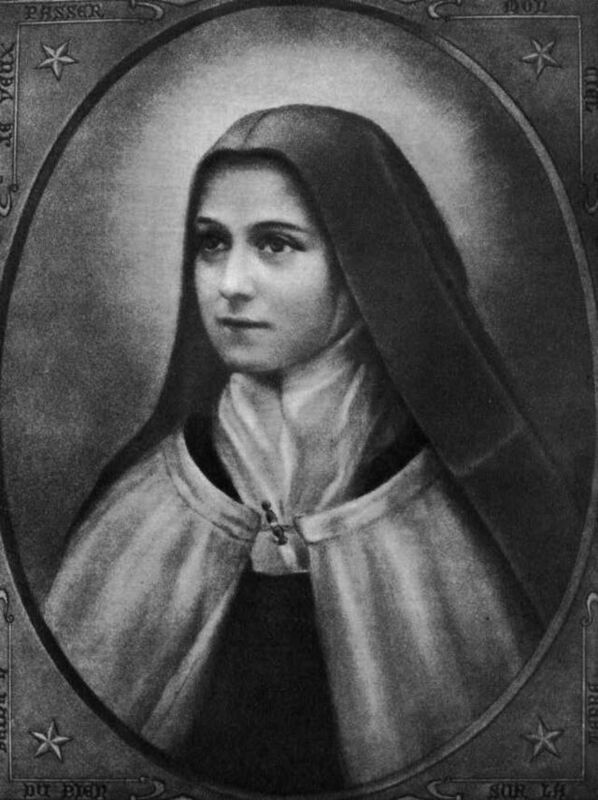 (Thérèse would pray for missionary priests in particular: as a result, this cloistered nun is one of the two patron saints of missionaries, along with the peripathetic Saint Francis Xavier). In her Christian resolve, in her calm confidence, she resembles no one so much as her great hero and countrywoman Joan of Arc, whom during her novitiate she portrays in a pageant, dressing up as the Maid of Orléans in makeshift paper armor. One of her Carmelite sisters photographed her in costume—this Joan, however, leans on crutches. The spirituality of Thérèse of Lisieux is usually illustrated by her self-denial and her willingness to accept the reproaches of her sisters in the convent. But this is still too narrow a view of Thérèse, who was able to embrace life fully because she fully understood its sufferings. "Neither do I desire any longer suffering or death, and still I love them both; it is love that attracts me," she writes in TheStory of a Soul. Taking her inspiration from St. Paul, who compared the Christian community to a body with many parts, Thérèse boldly declared that she would be the heart. During her bout with tuberculosis, Thérèse struggles greatly and even flirts with suicide—pointedly telling her Carmelite sisters that medicines should not be kept near the bed of sick persons. Yet, though she struggled, wept and raged, as almost any of us would, she continued to believe—drawing from a deep well of trust filled by the springs of a lifelong love affair with God. As the church historian Janice Farnham, a sister of the Religious of Jesus and Mary, has written, "The way of Thérèse is a way that pierces the darkness, not a ray of light." St. Thérèse of Lisieux, or to use the name chosen on the occasion of her profession of religious vows, Thérèse de l'Enfant Jesus et de la Sainte Face, is now found on small holy cards that portray her staring out frankly at the viewer, clad in a brown-and-white Carmelite robe, typically holding a bouquet of multicolored roses and a crucifix. She can be found in churches large and small around the world, standing silently in the identical pose as a polychromed plaster statue, a figure in brilliant stained glass or a portrait in a faded fresco. She can be found in the millions of copies of her autobiography, in countless languages and editions, scattered in homes, apartments, rectories and religious communities. And she can be found in the hearts of those who feel that she, above almost all the saints, understands what it means to be a human being who suffers and rejoices in everyday life. Her life—simple and complex, clear and opaque, childlike and mature, humble and bold, joyful and sorrowful—speaks to millions of people. And it speaks to me. Some days when I pray to Thérèse of Lisieux, I think of people who critique her spirituality harshly: too naïve, too childlike, too simplistic, too pious, too kitschy. But Thérèse had heard similarly harsh comments in the monastery, from sisters jealous of her youth, confused by her sanctity, and baffled by her charity. Such misunderstanding was part of her life. And I imagine Thérèse in heaven, smiling a little at this misunderstanding. Smiling at those who still see her as too naïve, too humble or too pious. Smiling at those who underestimate the power of humility. Smiling at all of these people. Smiling, and praying for them. furnace of Its merciful love. be united together in heaven for all eternity. An outstanding reflection on St. Therese. A most remarkable Saint ... her story constantly reminds me to never cease striving to get closer to Him ... every action committed should be for both Christ and the Church ... thanks for the inspiring article Father! Thank you for this beautiful reflection Father. I first met Ste. Therese as an exchange student, living with a French family in Lisieux. Her picture and her words have graced my bedroom or office wall ever since: "Je voudrais parcourir la terre et announcer l"Evangile" - "I would go over the earth and announce the Gospel!" Perhaps the greatest of Therese's followers was Dorothy Day, who put her little way into practice day after day at the Catholic Worker house in New York. I grew up in a home and family with a deep connection to certain saints. When my parents bought their home, one of the first things they purchased was a large statute of St. Anthony for the front lawn. It is still there 46 years later. Notwithstanding my family background and 16 years of Catholic education, it wasn't until I read Father Martin's book ''My Life With the Saints'' that I developed an appreciation for the rich gift of companionship we have in our Communion of Saints. Since reading the book I've been able to discern several instances where I know one Saint or another has been praying for me or my family before we even knew we needed the prayers. Thanks to Father Martin for opening my eyes and heart to our wonderful Saints. Therese's sister requested she write about her life. Therese decided not just to write about her life events but from the perspective of how God had worked in her life. I have thought that this task might have helped her endure her suffering. Maybe her sister thought it would help her. When someone is in a dark place to recall where God has been in your life in the past and write it down can help to pierce the darkness of the present. It's amazing how one book, one life has inspired so many including myself in a very real way. that Jesus is asking us to quench His thirst by giving Him souls, especially the souls of priests. . . Yes, let us pray for priests; let our life be consecrated to them . . . These souls [of priests] ought to be more transparent than crystal; but, alas, I feel that there are some ministers of the Lord who are not what they should be. And so, let us pray and suffer for them . . . Understand the cry of my heart! Is it possible to be a life long Theresean without knowing it, then gradually coming to know it by way of insightful glimpses through that Faith-game, a game children play called "Hide and Seek" He hides and I (we) seek, or we (I) hide and He seeks? I think this has happened to me, indeed still happens daily, like the hot coal of Faith, Hope, Charity in a censer, eventually covering in the ash of uncertainties, the hot coal of love becoming relatively cold, then reigniting, reddened in the blow of the Spirit, then cooling into ashen love again and again, but never going out. I like to think this is kind of Theresean. Thanks Fr. Martin for stirring up this reflection.